⬅ Do This in Your Next Meeting. It Works. I’ll tell you how I normally have in the past. I quit on everything. I quit chasing my dreams. I quit doing the right thing. I quit on what God had called me to. I quit trying to get better. I quit thinking that I would ever be anything more than what I was, what I knew, and what I had been told I would be. When pain came, everything else shut down. I became a hated man within my own body. But I heard something that began the process of changing my view of pain. It was this quote below. Below I share the video in which I first heard it. It somehow destroyed the little boy inside of me that said that PAIN is evil. It kicked the dream-stealing, PAIN-resistant demon inside of me right in the face. I began to realize that pain was a life experience. Pain is molding you. And you can either allow it to mold you in a negative way or a positive way. Pain is an obstacle on path to where you want to go. Pain is a fallen tree on the road of success. You can either move the tree; remove the obstacle, or you can give up, turn around and never again return to that road. The aimless man sees an obstacle and finds a new path, headed wherever the whims of the world lead him. Not so the driven man. He sees an obstacle and builds a path through it. The path of success is full of obstacles. 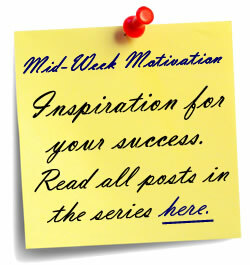 Your goal lies at the end of a narrow, bumpy, booby-trapped road through the jungle of life. But at the end…on the other side of PAIN…is a reward. Don’t ever forget that. Don’t ever forget your reward. Don’t ever doubt that you will get through the PAIN. And you will always be stronger on the other side of it. How do you deal with PAIN? 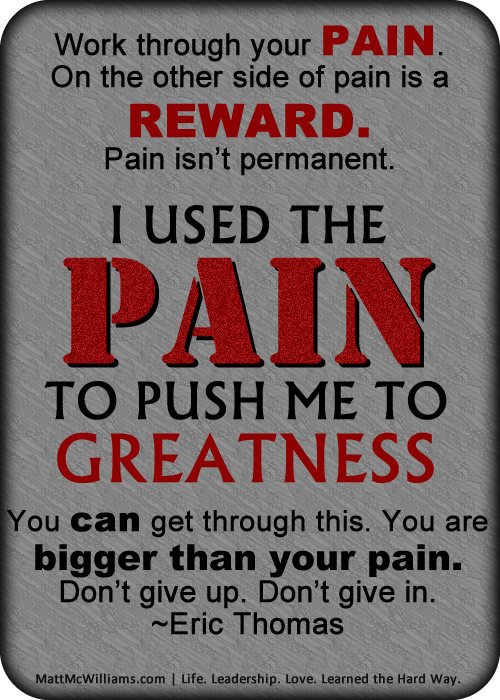 How can you start using pain to push you to greatness?